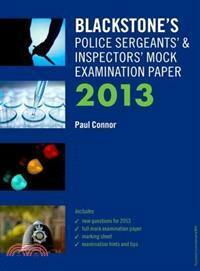 Blackstone's Police Sergeants' and Inspectors' Mock Examination Paper 2013 helps you prepare for your OSPRE Part 1 multiple-choice examination. Designed in an exam style, the paper presents questions from across the syllabus and fully referenced to the Blackstone's Police Manuals 2013. Split into two handy sections, the paper contains the 150 question mock exam booklet and answer sheet, and a second, sealed pack containing the answers and detailed marking matrix. Questions are written in the Type A format used in both the Sergeants' and Inspectors' examinations, and answers are provided with full explanations and references to the officially endorsed Blackstone's Police Manuals 2013. The paper tests students on all areas of the official syllabus in Blackstone's Police Manuals 2013, particularly recent legislation such as the Crime and Security Act 2010, the Police Detention and Bail Act 2011, the Criminal Procedure Rules 2011, and amendments to the Coroners and Justice Act 2009. Using the three hour recommended time limit, Blackstone's Police Sergeants' and Inspectors' Mock Examination Paper 2013 can help you practise your exam technique, assess strengths and weaknesses in your revision, and avoid unnecessary pitfalls.